"Sampath Speaking" - the thoughts of an Insurer from Thiruvallikkeni: Is Jugaad a Motor vehicle or a contraption ~ who is liable ?? 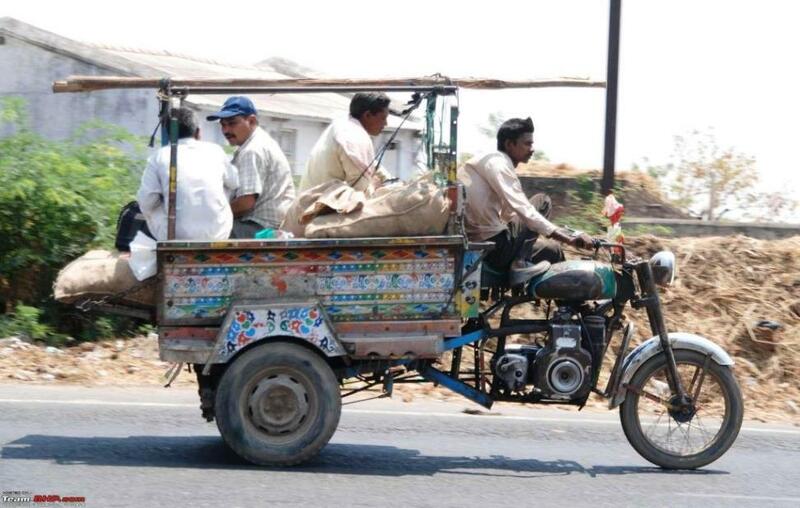 Is Jugaad a Motor vehicle or a contraption ~ who is liable ?? Vehicles with automotive power on road are regulated by Motor Vehicles Act – then there are hackney carriages. In UK, the name hackney carriage today refers to a taxicab licensed by the Public Carriage Office, local authority or the Department of the Environment depending on region of the country. In India there is ‘the Hackney Carriage Act 1879’ which is defined as any wheeled vehicle drawn by animals and used for the conveyance of passengers which is kept or offered or plies for hire. Quite unfortunately such commercial vehicles, sometimes more powerful than their poor cousins do not require a permit and not sure of the class of Driving Licence ! In North, there is this perculiar ‘Jugaad’ – the colloquial word that has many meaning, depending on situation and usage. Roughly translated, jugaad is a "hack” but could also refer to an innovative fix or a simple work-around, a solution that bends the rules, or a resource that can be used in such a way. It is may even be used to signify creativity—to make existing things work, or to create new things with meager resources. Some call it a management technique of finding acceptable solutions with ingenuous engineering techniques !! This is not about people, the adaptability of systems and the way people manipulate to have their own way – but more on such uncontrolled make shift vehicles, the problems they pose, the accidents they cause, the trauma of road accident victims and more specifically, whether they are insurable and if yes, whether Insurers would be held liable by Courts. There have been occasions when the Insurers having insured the vehicle still plead that this vehicle does not conform to Motor Vehicle rules and hence cannot be strictly called as a vehicle and consequently no liability should be fastened to the Insurers. Now comes a decision of Rajasthan High Court that ‘Jugad is indeed a vehicle – its owner and its Insurer are liable to pay accident damages’. Reversing an earlier order by the motor vehicle accident claims tribunal, the Rajasthan high court held that ‘jugaad’ is a motor vehicle and asked the owner of the vehicle to pay a compensation of Rs 4,94,512, with 6% interest from the date of filing the claim, to the family of an accident victim. ‘Jugaad’ was officially banned in the state since 2010 yet is still a major mode of transport in the rural areas of Rajasthan. The single bench of Justice Bhanwarilal Sharma gave the order following an appeal by victim Girdharilal’s wife, Santara Devi, a resident of Sanwaloda Purohitan in Sikar, challenging the claims tribunal’s order. The Motor Accident Claims Tribunal had turned down the claim on the grounds that, “the ‘jugaad’ cannot be considered as a vehicle so it cannot decide on the matter”. It said ‘jugaad’ is only a contraption used for agriculture purposes. The petitioner said victim Girdharilal was returning to his village at Sanwaloda Purohitan from Badhadar village on January 29, 2005 in a ‘jugaad’ when it met with an accident at about 6pm. According to other passengers, driver Subash was driving the vehicle recklessly. The vehicle met with an accident and turned turtle, trapping Girdharilal underneath it. He died on the spot after suffering grievous injuries. Now the High Court has ruled in favour of the victims directing the owner to pay compensation arising out of use of the vehicle on a public road. A web search led to an earlier case – an appear from Order No. 2110 of 2010 in The Oriental Insurance Co. Ltd. Vs. Smt. Shivpari Devi & Others. The appeal was filed under Section 173 of the Motor Vehicles Act, 1988, against the Judgment and Order/Award passed by the Motor Accidents Claims Tribunal, Baghpat in Motor Accident Claim Case No. 136 of 2008 arising out of death of a person travelling in the vehicle. The petition made by the dependents of a person who had undertaken yatra from Delhi to Haridwar on foot having taken "Kawand"; and made his return in a Jugad which was involved in a collision with a transport bus resulting in his death. The Claim Petition was contested by the Uttarakhand State Road Transport Corporation as well as by the Appellant-Insurance Company. The Insurers also took the plea that the owner of Jugaad committed breach of terms and conditions of the policy. Of the primary issues, the Tribunal held that the accident in question took place on account of rash and negligent driving by the Drier of the vehicle in question (i.e. the Bus) as a result of which the said Durga Nand Chaurasiya was seriously injured, and he died during his treatment. Interestingly the bus was not having valid documents and was violating the rules, however, the Tribunal gave a ‘pay and recovery award’ directing the Insurers in the first instance to pay the compensation and recover the same from the Uttarakhand State Road Transport Corporation.